이제는 새로운 microsoft 365 보안 센터 와 Microsoft 365 준수 센터 를 일반적으로 사용할 수 있음을 알리는 것이 좋습니다.We are pleased to announce that the all-new Microsoft 365 security center and Microsoft 365 compliance center, are now generally available. 이 문서를 읽으면 새로운 기능, 예상 되는 작업및 필요한 라이선스 및 사용 권한에대 한 개요를 확인할 수 있습니다.Read this article to get an overview of what's new, what to expect, and required licenses and permissions. 새로운 Microsoft 365 보안 센터 에는 id, 데이터, 장치, 앱 및 인프라 간의 보안을 관리 하 고 모니터링 하는 데 도움이 되는 대시보드가 포함 되어 있습니다.Your new Microsoft 365 security center includes a dashboard to help you manage and monitor security across your identities, data, devices, apps, and infrastructure. 또한 새로운 Microsoft 보안 점수, 새 디바이스 위협 보고서, 새 id 위협 보고서 및 Cloud App Security reports에 쉽게 액세스할 수 있습니다.You will also have easy access to your all-new Microsoft Secure Score, new device threat reports, new identity threat reports, and your Cloud App Security reports. Microsoft 365 보안 센터를 처음 사용 하는 경우 시작 하는 데 도움이 되도록 화면 위쪽에 정보가 표시 됩니다.When you use the Microsoft 365 security center for the first time, you'll see information across the top of the screen to help you get started. 또한 가장 관심이 있는 보안 기능으로 쉽게 이동 하는 방법을 알아봅니다.You'll also see how to navigate easily to the security features you're most interested in exploring. 자세한 내용은 Microsoft 365 보안 센터 개요를 참조 하세요.To learn more, see Overview of the Microsoft 365 security center. 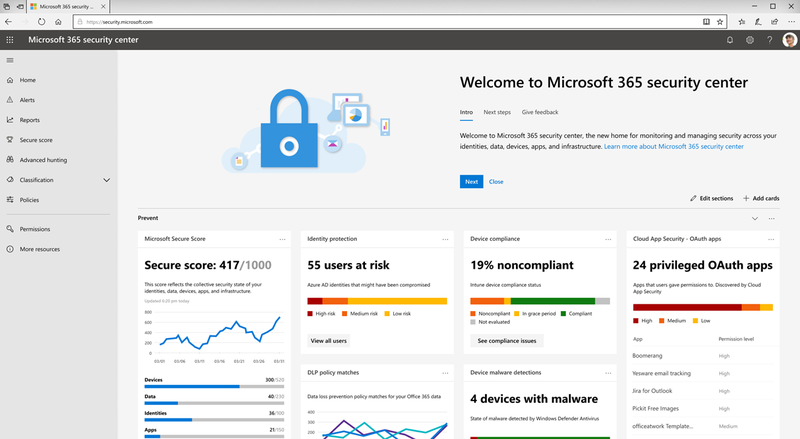 Microsoft 365 보안 센터에 액세스할 수 있게 됩니다 https://security.microsoft.com.You will be able to access the Microsoft 365 security center at https://security.microsoft.com. Microsoft 365 보안 센터에 액세스 하려면 유효한 Azure Active Directory 역할이 할당 되어 있어야 합니다.You must be assigned a valid Azure Active Directory role to access the Microsoft 365 security center. 자세한 내용은이 문서의 필수 라이선스 및 사용 권한 섹션을 참조 하십시오.To learn more, see the Required licenses and permissions section (in this article). 새로운 microsoft 365 준수 센터 를 통해 microsoft 준수 관리자를 확인할 수 있으며,이를 통해 전반적인 규정 준수 상황을 반영 하 고 복잡 한 준수를 충족 하도록 설정을 구성 하는 데 도움이 되는 권장 조치를 얻을 수 있습니다. 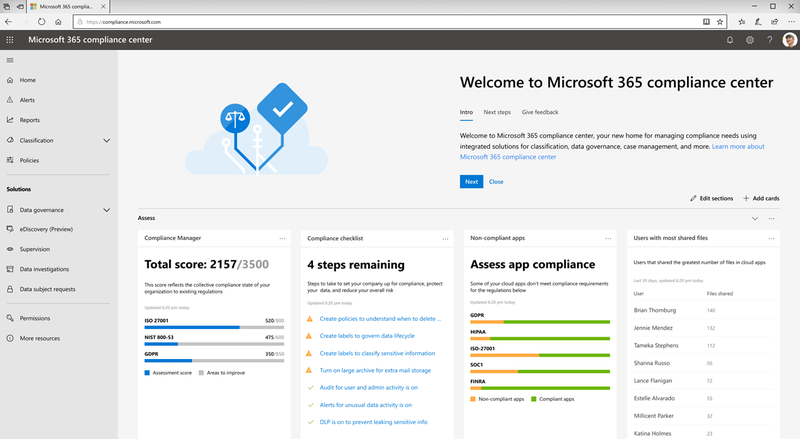 책임.Your new Microsoft 365 compliance center provides you with visibility into Microsoft Compliance Manager, which reflects your overall compliance posture and gives you recommended actions to help you configure settings to meet complex compliance obligations. 민감도 및 보존 레이블과 정책, DLP (데이터 손실 방지), 데이터 거 버 넌 스, eDiscovery, 데이터 주체 요청 (dsrs), 사례 관리 및 Cloud App Security에 쉽게 액세스할 수 있습니다.You’ll have easy access to sensitivity and retention labels and policies, data loss prevention (DLP), data governance, eDiscovery, data subject requests (DSRs), case management, and Cloud App Security. 또한 실행 가능한 통찰력을 얻고 지능적인 자동화를 활용 하 여 준수 위험을 줄이고 디지털 공간을 보호할 수 있습니다.Additionally, you can gain actionable insights and leverage intelligent automation to reduce your compliance risks and safeguard your digital estate. Microsoft 365 준수 센터를 처음 사용 하는 경우 시작 하는 데 도움이 되도록 화면 위쪽에 정보가 표시 됩니다.When you use the Microsoft 365 compliance center for the first time, you'll see information across the top of the screen to help you get started. 가장 관심이 있는 준수 기능으로 쉽게 이동 하는 방법을 볼 수 있습니다.You'll see how to navigate easily to the compliance features you're most interested in exploring. 자세한 내용은 새로운 Microsoft 365 준수 센터 시작을 참조 하십시오.To learn more, see Welcome to your all-new Microsoft 365 compliance center. 에서는 Microsoft 365 준수 센터에 액세스할 수 있습니다 https://compliance.microsoft.com.You will be to access the Microsoft 365 compliance center at https://compliance.microsoft.com. Microsoft 365 준수 센터에 액세스 하려면 유효한 Azure Active Directory 역할이 할당 되어 있어야 합니다.You must be assigned a valid Azure Active Directory role to access the Microsoft 365 compliance center. 자세한 내용은이 문서의 필수 라이선스 및 사용 권한 섹션을 참조 하십시오.To learn more, see the Required licenses and permissions section (in this article). 지금 사용 가능 하세요!Available now! 새 microsoft 365 보안 센터 및 새로운 microsoft 365 준수 센터는 이제 3 월 2019이 되는 microsoft 365 고객 에게도 제공 됩니다.The new Microsoft 365 security center and the new Microsoft 365 compliance center are now generally available to Microsoft 365 customers, as of the end of March 2019. Office 365 보안 & 준수 센터를 포함 하는 독립 실행형 계획과 같은 다른 구독을 사용 하는 경우에는 곧 새로운 Microsoft 365 보안 센터 및 microsoft 365 준수 센터에 액세스할 수 있습니다.If you have another subscription, such as a standalone plan that includes the Office 365 Security & Compliance Center, you'll have access to the new Microsoft 365 security center and Microsoft 365 compliance center soon. 자세한 내용은 Microsoft 365 로드맵를 참조 하세요.To learn more, see the Microsoft 365 roadmap. 간편 하 게 액세스할 수 있습니다.Easy access! 향상 된 탐색, 통합 솔루션 및 능률적인 환경을 통해 가장 관심 있는 정보를 보고 액세스할 수 있으며 Microsoft 365의 강력한 보안 및 규정 준수 솔루션을 활용 하는 데 도움이 됩니다.With improved navigation, integrated solutions, and a streamlined experience, you'll be able to see and access the information you're most interested in and take advantage of the powerful security and compliance solutions in Microsoft 365. 또한 향후 몇 개월에 더 많은 기능과 솔루션을 추가 하는 동안에는 Office 365 Security & 준수 센터 (https://protection.microsoft.com)를 계속 사용할 수 있습니다.And, while more functionality and solutions are being added over the coming months, the Office 365 Security & Compliance Center (https://protection.microsoft.com) is still available. Microsoft 365 관리https://admin.microsoft.com센터 ()로 이동 하 고 탐색 창에서 모두 표시를 클릭 한 다음 보안 또는 규정 준수를 선택 합니다.Go to the Microsoft 365 admin center (https://admin.microsoft.com), and navigate from there (in the navigation pane, click Show all, and then choose Security or Compliance). 또한 기존 Office 365 Security & 준수 센터 (https://protection.office.com) 에서도 설정을 구성 및 관리할 수 있습니다.In addition, you can still configure and manage settings in the existing Office 365 Security & Compliance Center (https://protection.office.com). 구성은 기존 Office 365 보안 센터 및 microsoft 365 준수 센터의 새로운 microsoft 365 보안 센터가 준수 센터에서 유지 됩니다.Your configurations will be maintained in both the existing Office 365 Security & Compliance Center and in the new Microsoft 365 security center and Microsoft 365 compliance center. 새로운 microsoft 365 보안 센터와 Microsoft 365 준수 센터를 받으려면 조직에 microsoft 365 E3 또는 e5에 대 한 구독이 있거나, Office 365 Enterprise E3 또는 e5, Enterprise Mobility + security로 구성 된 볼륨 라이선스와 동등한 볼륨이 있어야 합니다. E3, e5 및 Windows 10 Enterprise E3/E5)To get the new Microsoft 365 security center and Microsoft 365 compliance center, your organization must have a subscription to Microsoft 365 E3 or E5, or a Volume Licensing equivalent (which consists of Office 365 Enterprise E3 or E5, Enterprise Mobility + Security E3 or E5, and Windows 10 Enterprise E3/E5). 이러한 계획에 대 한 자세한 내용은 사용자에 게 적합 한 Microsoft 365 Enterprise 솔루션 검색을 참조 하십시오.To learn more about these plans, see Discover the Microsoft 365 Enterprise solution that’s right for you. 새 Microsoft 365 보안 센터에 액세스 하려면 사용자에 게 전역 관리자, 준수 관리자, 준수 데이터 관리자, 보안 관리자, 보안 운영자 또는 Azure Active Directory의 보안 독자 역할을 할당 받아야 합니다. Microsoft 365 준수 센터Users must be assigned the Global Administrator, Compliance Administrator, Compliance Data Administrator, Security Administrator, Security Operator, or Security Reader role in Azure Active Directory to access the new Microsoft 365 security center or Microsoft 365 compliance center. 이러한 역할에 대 한 자세한 내용은 Permissions in the Office 365 Security & 준수 센터를 참조 하십시오.To learn more about these roles, see Permissions in the Office 365 Security & Compliance Center.